List of families after Martin & Davis 2001. Braga, E., R. Zardoya, A. Meyer, and J. Yen. 1999. Mitochondrial and nuclear rRNA based copepod phylogeny with emphasis on the Euchaetidae (Calanoida). Marine Biology 133:79-90. Damkaer, D. M. 1996. 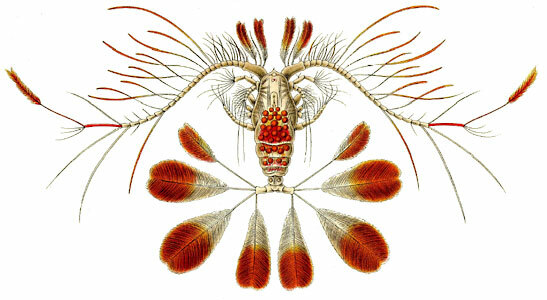 Copepod taxonomy: discovery vs. recognition. Proceedings of the Biological Society of Washington 109:687-694. Huys, R. and G. A. Boxshall. 1991. Copepod Evolution. The Ray Society, London. Klein, J. C. V. 1998. Interpretation of character phylogenies in calanoid copepods by implementing Dollo's law. Journal of Crustacean Biology 18:153-160. Ohtsuka, S. and R. Huys. 2001. Sexual dimorphism in calanoid copepods: morphology and function. Hydrobiologia 453:441-466. ZooGene. A DNA Sequence Database for Calanoid Copepods and Euphausiids.